To really experience Abu Dhabi, you have to get up high – really high, to ear-popping elevations like Ray's Bar, on level 62 of Jumeirah at Etihad Towers. Its name might make it sound like a sports bar, but Ray's is no such thing: it's a top-class watering hole, complete with Champagne cocktails, a fine wine list, and posh tapas like Wagyu beef burgers and tempura wasabi prawns. From your priviledged viewpoint you'll spy the bustle of the Corniche, the islands along the coast of the city, and the clusters of skyscrapers for which Abu Dhabi is famed. Visit in the late afternoon to toast the setting sun, then head to Stratos at Le Royal Meridien Abu Dhabi for dinner – it's a swanky revolving restaurant, where the food certainly lives up to the view. Sure, the views from skyscraper cocktail bars and revolving restaurants are impressive – but what if you're travelling with children? If you want to enjoy Abu Dhabi's cityscapes without incurring the wrath of waiters and well-heeled diners, head to Marina Mall – a shopping centre on the Corniche with its very own viewing tower. Take the glass-fronted lift to the top to look out at the city in every direction. You'll spy those iconic high-rises, the sumptuous sands of city beaches, and traditional dhows plying the waters of the Arabian Gulf. The kids can ooh and aah as much as they like, and you can relax. Think Abu Dhabi is all skyscrapers and malls? Think again – it's a haven for wildlife too. 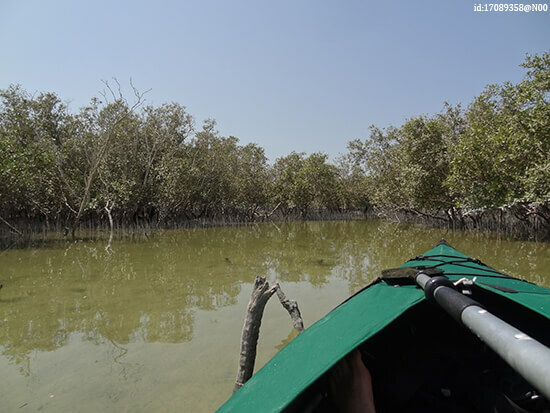 Just 10 minutes by taxi from the centre of Abu Dhabi, Eastern Mangroves National Park is home to pink flamingoes, bottlenose dolphins, dugongs, red foxes and more. The mangrove forest was here long before the city sprung up and it's a peaceful, beautiful spot. Experience this urban wilderness on a kayaking tour – you'll slip silently between the sandy islands, spotting sea birds and wildlife while the high-rise hotels glitter on the horizon. When Formula 1 comes to town, there is no better seat in the house than Yas Viceroy Abu Dhabi. The track literally runs around the hotel, and all of its restaurants overlook the action: indeed, on F1 weekend there's no escaping the buzz and glamour of the race. If you're a fan, this is the best view in the city – hands down. But Yas Viceroy doesn't lose its sparkle when F1 leaves town. It's perched on the edge of the Yas Marina, where the world's most expensive yachts bob in turquoise waters. That's a pretty impressive sight at any time of year – and next door, du Arena attracts some of the biggest musical names in the world (this year, the line-up includes Robbie Williams and Bon Jovi). 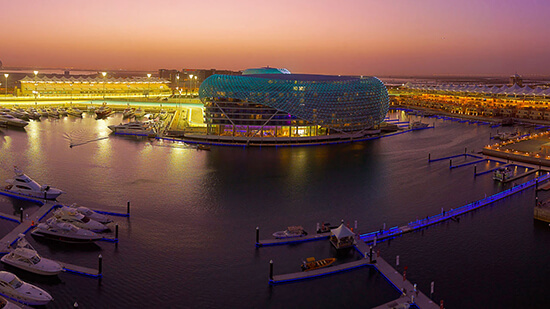 Usually, the stars stay at Yas Viceroy – a pretty cool view over breakfast, we reckon. However rushed your visit to Abu Dhabi may be, you must squeeze in a visit to Sheikh Zayed Grand Mosque. It's a magnificent mosque clad in white marble, gold and mother of pearl, with seven glittering crystal chandeliers and a vast mosaic-covered courtyard. Enjoy it up-close (it's open daily, except Friday morning), then retreat to the Shangri-La Hotel Qaryat Al Beri to view it from afar. Whether you choose to wallow in the hotel's infinity pool, dine in one of its many fabulous restaurants, or splash out on a room, you'll be treated to views of the Grand Mosque just across the canal. Catch the call to prayer drifting on the breeze, and marvel as the marble exterior changes colour with the setting sun. Abu Dhabi isn't just a city – it's a whole state, much of which is taken up by the vast (and very sandy) Empty Quarter. There's a lot of desert to explore. This is the place to indulge your Arabian Nights fantasies, with star-studded skies, empty horizons, and incense wafting on the warm night air. 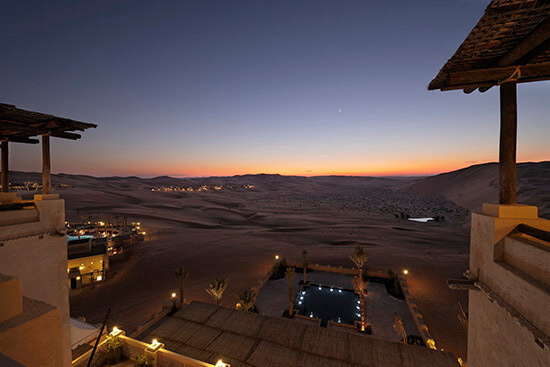 If you have 4X4 wheels and you know what you're doing, desert camping in Abu Dhabi is wild and wonderful – but if you fancy more pampered views, make a beeline for the Qasr Al Sarab Desert Resort by Anantara. Saadiyat Island is a little slice of Caribbean-esque loveliness – all sugary sands and endless clear waters. 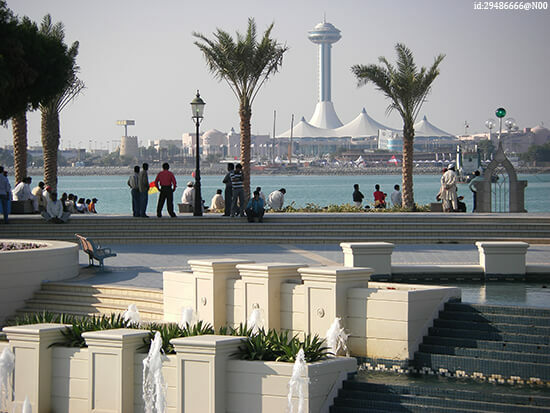 The beaches feel off-the-beaten track, but you're only a 20-minute drive from the very centre of Abu Dhabi. If you need a calming view after all of that sightseeing, this is the spot. 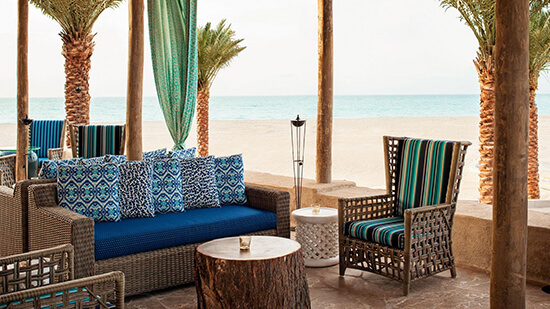 You can wander along its public beach for free, but if you're feeling peckish then seek out Turquoiz – a cute little beach bar on the private sands of St Regis Saadiyat Island. In a city that's always dressed up, its chilled beach-side vibe is refreshing. And on a lazy sunny day you can't beat the view of the sea from one of its squishy sofas, over the rim of a cocktail glass and platter of seafood. Bliss. Want to book a beach holiday or stopover in Abu Dhabi en route to Australia? 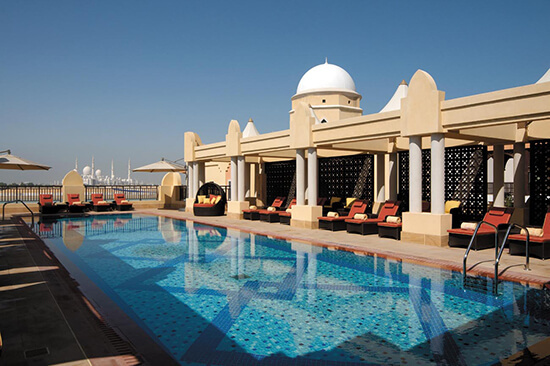 Speak to one of our Travel Experts about our range of Escapes to the Arabian Gulf.